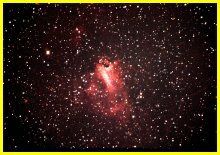 M17 lies in the constellation Sagittarius, close to those other beautiful emission nebulae M8, M16 and M20, and is known variously as the Swan, Omega or Horseshoe Nebula. 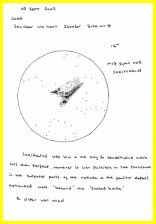 Unlike M16, it is very bright and visible in a small telescope. Like the others in the group it never gets very high in the sky from Britain, so around the middle to end of July it is worth finding a dark vantage point with a good southern horizon, or heading further south.